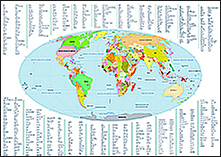 Editable royalty-free map of World in vector-graphic online store. 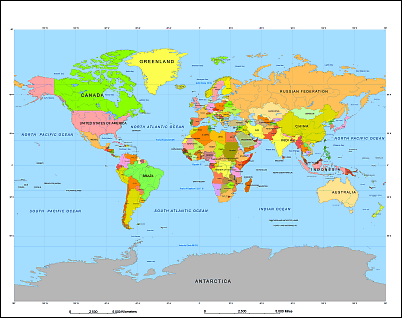 If we want to see the world as a whole, we can only do so by using outstretched cilyndrical world maps. Most of the time these world maps are not very accurate and most of the deficiencies occur close to the North and South Poles. 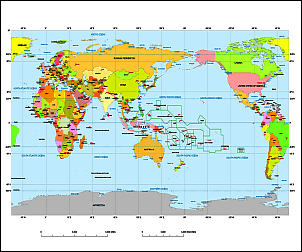 The first group of our line maps consists of the basic maps where next to the several free maps we see those that have the usual grids and the famous latitudes can be seen as well. 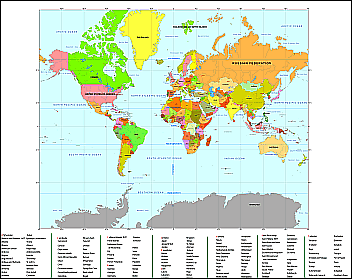 Thematic maps (country dial and internet code, int.organizations e.g). 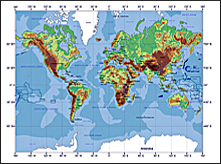 The world maps can be categorized into two bigger groups, the rectangular shape maps and the oval shape or ellipsoid maps. 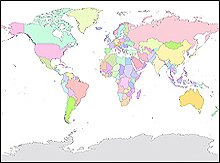 The first group consists of the widely used WGS84 or Plate Carreé projections, the Gall, Miller or Mercator projections. 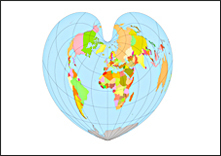 The oval shape world maps are the Robinson and Mollweide projections. 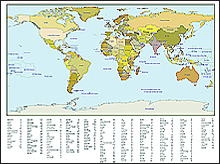 These are the most widely known world map forms. These vector-graphic maps can also be painted and resized without loosing on quality. 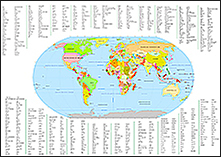 Compared to other websites on our site you can see lists of countries and capitals on a certain map, and other extraordinary maps like the Russian world map, the historical character world map, the international dialing code world map and the National internet TLD (top-level domains) or internet suffix maps. A map of the earth is a representation of a curved surface on a plane. Therefore a mapprojection must have been used to create the map, and, conversely, maps could not exist without map projections. They readily accommodate an enormous range of scales;they are viewed easily on computer displays; they can facilitate measuring properties of the terrain being mapped; they can show larger portions of the Earth`s surface at once.